This weekend’s adventure was to Joe Overstreet Road and Landing. I haven’t been to the area since three winters ago during the Central Florida Specialties field trip. Some Whooping Cranes are somewhat regularly seen from the road on the Double C Bar Ranch on Canoe Creek Road, just before Joe Overstreet Road. I did not see any Whoopers on this trip, though. From Canoe Creek Road and for most of Joe Overstreet Road the landscape is dominated by upland fields and scattered trees. As one gets closer to Joe Overstreet Landing at Lake Kissimmee of course the landscape changes to marshes and open water, with some wet meadows (much of the land along the road is a cattle ranch). The transition from upland to wetland/lake was best illustrated by the change of crows, with American Crows along most of the road and Fish Crows closer to the lake. Not only were the voices a clear indication of species change, but the American Crows I saw seemed perceptually larger and more robust than the Fish Crows. Usually I have a much harder time telling the difference by sight, as the two species have a significant overlap in their sizes. For whatever reason the American Crows in this part of the state are quite large. 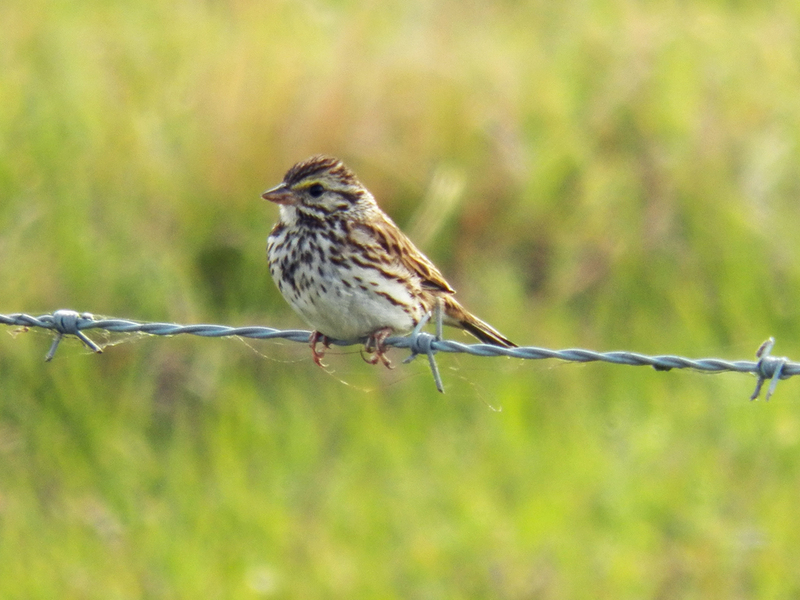 There were small bands of Savannah Sparrows along the barbed-wire fences. For the most part they seemed content to watch me, only fleeing if I stepped a little too close, but never really flying too far. The Savannah Sparrow equivalent of sitting on the front porch. Someone fetch this bird some lemonade! Even the birds of prey were relatively approachable. A juvenile Red-shouldered Hawk sat just outside my car’s window, paying me little mind. It didn’t fly off the post it was on until I got out of the car, and even then it just swooped up to the top of the nearest utility pole. 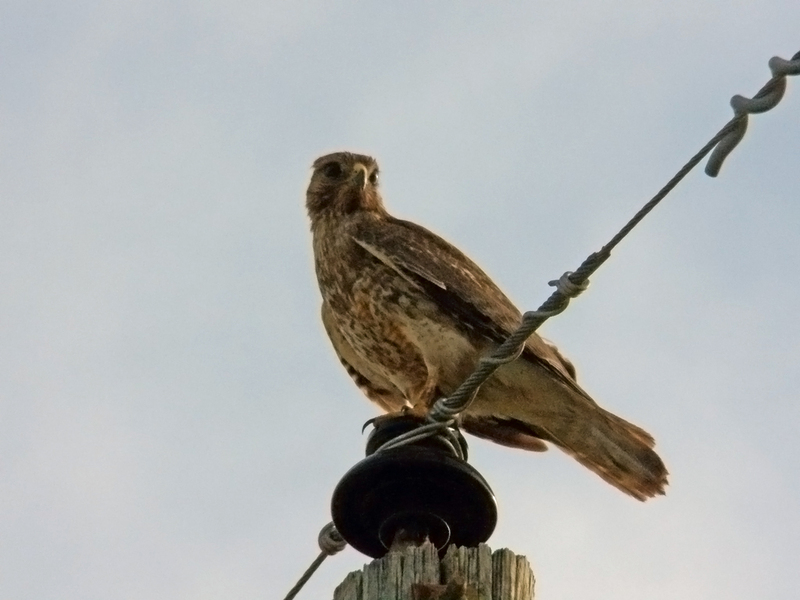 The nearby power lines and widely spaced trees make good perches for the raptors to hunt from. I saw both “regular” and “Florida form” Red-shouldered Hawks, including some that flew into a copse of pine trees and harassed a Great Horned Owl (from the sounds of it). The American Kestrels hung around nearby too, making the sparrows a little nervous, but the heavy hitters in the intimidation department were the Bald Eagles. Any time their shadows fell nearby, the sparrows and meadowlarks would dive for cover. Down at the boat ramp by the lake there were American Coots, Common Gallinules, a Pied-billed Grebe and some Cattle Egrets. I scanned the lake and its more distant far shore for Snail Kites, but I did not see any. There were some gulls, terns, and a couple of Bald Eagles. I saw one Osprey and very few herons (I think I saw one Great Egret and a small group of Little Blue Herons). I could hear at least one Limpkin calling, but aside from some Boat-tailed Grackles and Red-winged Blackbirds, it was fairly quiet at the lake. 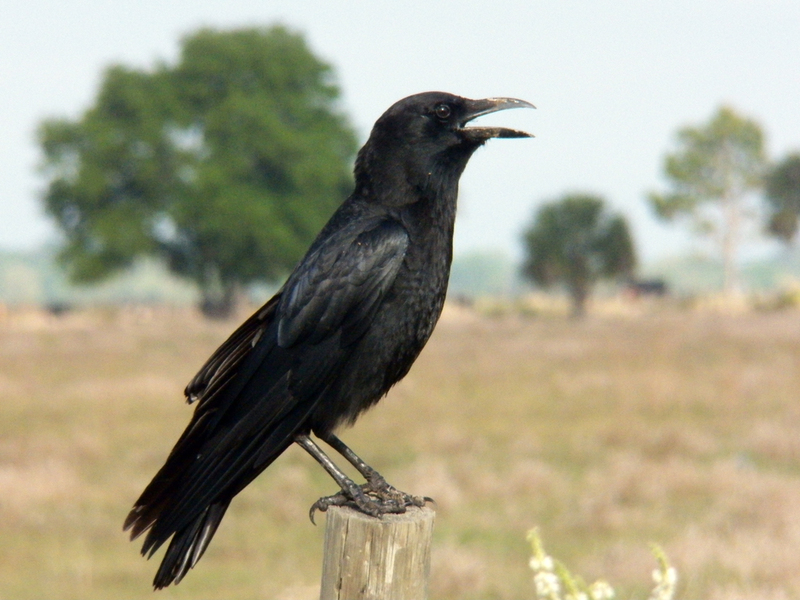 Crows are opportunistic scavengers and omnivorous, and are not above raiding the nests of songbirds (for eggs or young), and will eat lizards and small mammals if given the chance. They also will eat carrion. During nesting and fledging season, this does not endear them to smaller birds, and they will sometimes be chased or mobbed like hawks, eagles, or owls. This is what an American Crow looks like after being repeatedly dive-bombed and defecated on by 2 very angry Northern Mockingbirds. The small white specks are remnants of the altercation. It was a final treat of the morning to see several Northern Bobwhites. I’ve heard them in various places in my adventures, but I haven’t had a solid visual identification. I saw one step out of some dead palm fronds for a moment, before a Red-shouldered Hawk caused it to take cover. I also managed to flush some females out, where they had been hiding in plain sight. They blended into the brown grasses and small shrubs so well that I didn’t know they were there until they quickly spang up in a burry flight to another concealed spot. A Northern Bobwhite quail moments before dashing back under cover. Besides birds attacking the American Crows, the Eastern Meadowlarks were courting and having territorial disputes. A pair of Loggerhead Shrikes were chasing each other around, too. I almost got one of my hope-for photographs, but the moment was so brief, I didn’t even have time to lift my camera. There was a Northern Mockingbird on a dead limb of a small tree, and the shrikes flew up in to the same tree. 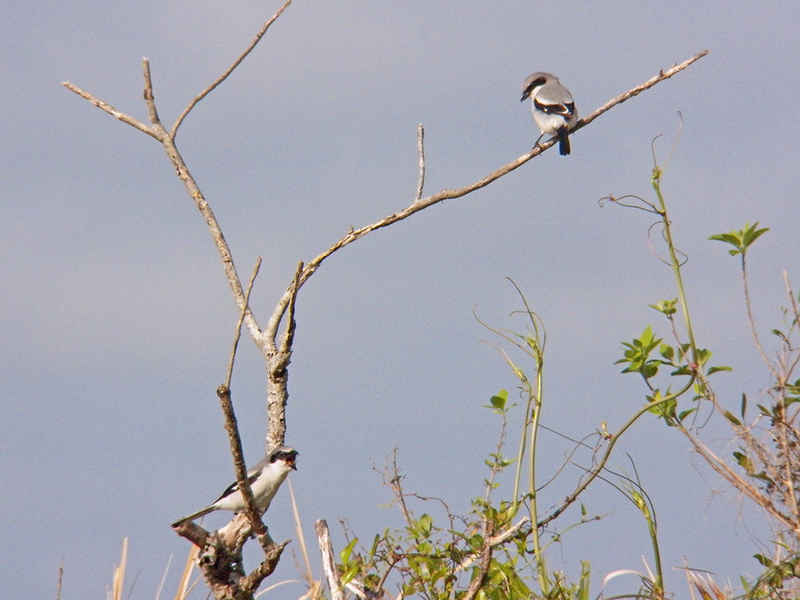 For an instant both a Northern Mockingbird and a Loggerhead Shrike were in the same tree, in the same field of view! I would really like to get such a photograph, showing the similarities and differences between these two birds. Moments after a Northern Mockingbird was chased off the limb on the right side of this dead tree-top. The bird at the bottom seems to be eating something as its companion watches. Before turning onto Canoe Creek Road again, I stopped to watch a few Eastern Bluebirds fly and catch insects. I actually thought they were flycatchers at first, but the orange breast threw me off. When I finally got a good binocular view in full sunlight I saw they were actually bluebirds. Nearby, a Tufted Titmouse was calling and hopping through some branches while Northern Cardinals sang nearby. I drove up to the Double C Bar Ranch for one final search for Whooping Cranes but coming up empty, I headed for home. I took a quick detour to the Wild Florida wildlife park and passed some Sandhill Cranes on the road leading to the parking lot. I didn’t really have time to look around, so I just circled the lot and headed back to the main road. I’m hoping to check eBird and the e-mail lists to see if the Whooping Cranes are still being seen there, and to get some better tips for getting a good look. I’ll likely head back to Joe Overstreet Road soon, before the weather gets too hot. 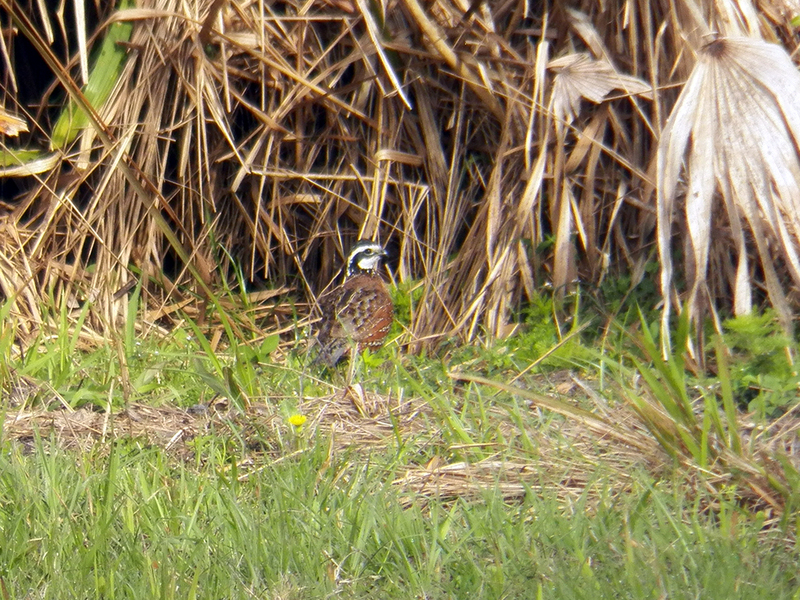 Posted on 2015 March 16 2015 March 17 by Lonely BirderPosted in BirdingTagged Birding, birds, Joe Overstreet Road, Lake Kissimmee, Osceola County.